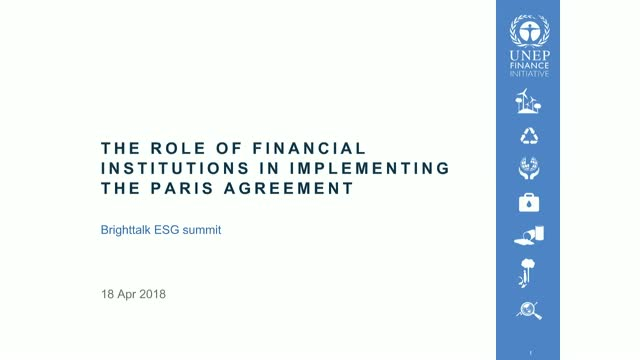 Financial institutions have a key role to play in implementing the Paris Climate Agreement and realizing the UN’s Sustainable Development Goals. In this session, UN Environment’s Finance Initiative (UNEP FI) will present its experiences with three key ongoing work streams related to the achievement of the world’s agreed goals. Remco Fischer, Programme Lead, Climate Change, will present on the financial institutions piloting the Task-Force on Climate-Related Financial Disclosures recommendations and on the Portfolio Decarbonisation Coalition. Martin Schoenberg, Energy Efficiency Project Coordinator, will present UNEP FI’s cooperation with the European Commission and G20 to scale up energy efficiency investment. Elodie Feller, Industry Lead, Investment, will present recent work on assessing fiduciary duty and its linkages to ESG in key markets.